A little triumvirate of buildings sits atop Vienna’s vast collection of classical music venues: the State Opera House, the Musikverein, and the Konzerthaus. Each venue has its own character. Even if you rank the Konzerthaus behind the other two, it’s a bit like being the third-best basketball team in the USA: third-best locally, but still one of the very best in the world. 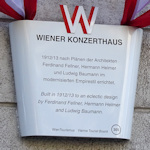 A relative youngster in Vienna’s musical history, the Konzerthaus opened in 1913, its construction prompted by the city’s growing population and demands for a more modern event location. Over 100 years later, and it’s second only to the Musikverein in terms of prestige as a venue for orchestral performances; compositions by the likes of Richard Strauss, Zemlinsky, Schönberg, and others enjoyed world premieres here. In contrast to its older colleague, the Konzerthaus offers a more eclectic, dare we say “adventurous”, programme of events and concerts that includes jazz, world music, Viennese folk, literary readings, and more. It’s also a main venue for the Wien Modern contemporary music festival. Nevertheless, its focus remains on classical music, whether string quartets, choral renditions, sonatas and soloists, or full orchestral works, attracting the world’s elite musicians to its four concert halls. It’s also the main home for the Vienna Symphony Orchestra (the Wiener Symphoniker). The official website has full details of the concert programme over the coming months. Note that the playing season extends from September to June, with a break across July and August. You can buy tickets online direct from the site, too (delivered by email, post or held for collection), or in person from the Konzerthaus ticket office. Konzerthaus members get advanced access to tickets and the venue is popular. So once you know your travel dates, check the programme and, if anything tickles your fancy, book seats as early as you can. Subway: Travel to the Stadtpark station on the U4 line and exit south. When you emerge outside, just keep walking straight ahead for 2 minutes, passing the Intercontinental hotel on your left. Bus: Take the 4A line to the Akademietheater (at the same-named stop). The theatre backs onto the Konzerthaus. The venue is also a 4-minute walk from Schwarzenbergplatz, which is served by the 2, D, and 71 trams.